Painting your garage floor will make your life easier in many ways. It will render your garage much easier to clean, and significantly less dirt and debris will be tracked into your home. How many times have you washed your kitchen floor, only to have someone track through with dirty feet? Nick Mejia Painting has the answer. 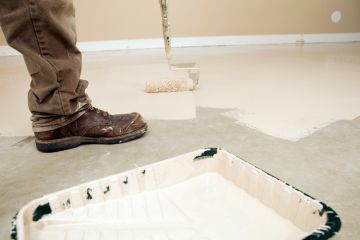 Call our expert painters to apply a coat of epoxy paint on your garage floors. They will look great, stay cleaner and oil and grease will not penetrate the surface, staining your concrete. If you are looking for a reputable garage floor painter, call (650) 397-2422 today for a free, no obligation quote. Nick Mejia Painting is a leading provider of garage floor painting and coating services. Our expert technicians have over 34 years of residential painting experience and can help your garage floor stay new looking. The process begins by carefully preparing the surface. The floor is swept, then cleaned, removing any dirt or grease. Next we work on filling in any cracks or holes. Then Nick Mejia Painting professionals finish by applying the paint, coating, sealant, urethane or epoxy that has been selected for the job. Serving the area since 1985, Nick Mejia Painting is skilled in local garage floor painting. Call (650) 397-2422 today and learn how we can help preserve and beautify your garage floor.